Want a picture of just how much of a cheat code the Warriors are? Take a look at this game against the Pacers. Don’t look at the opponent. 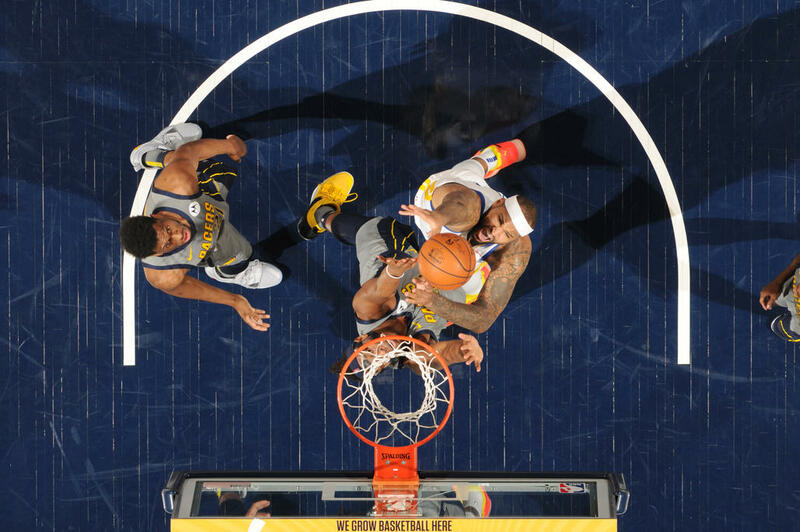 Without Victor Oladipo, the Pacers were clearly overmatched. But take a deeper look into how the Warriors won. They won by 32 points, dropping 132 points on an opponent. They scored almost 40 in the first quarter and nearly had a minimum of 30 in every quarter. They were one-point shy in the second, scoring only 29. Now, those are Warriors numbers, sure. But what if I told you that they were missing Draymond Green while Kevin Durant and Klay Thompson were having off shooting nights. Yup. Durant had only 16 points on 33% shooting. Thompson also had 16 points at a slightly better 43% clip. Even with those “challenges”, this game was over by halftime. That’s because even with an All-Star out and two All-Stars having off games, the Warriors still have two other All-Stars to rely on. DeMarcus Cousins continues his strong showing after returning from injury. He followed up a monster double-double against the Celtics with a 22-point, six-rebound performance. Leading the way for the Warriors was the ultimate cheat code, Steph Curry. He didn’t have one of those 40-point explosions he’s known for when his teammates struggle. All he needed to do was score 26 points. But he did it in the most efficient manner. Curry shot 10/13 from the field and 6/8 from beyond the arc. That clean clip made up for the messy shooting of Durant and Thompson. The only scare the Warriors had to face was when Cousins crashed to the floor early in the game. Barely five minutes into the game, Cousins got the steal at the top of the key and took the ball all the way to the hoop on the other end. Myles Turner wrapped both arms around Cousins to stop the big man from getting to the hoop. As Cousins was falling, Edmond Summer crashed into his legs trying to make a defensive play as well. Cousins looked like he was in pain on the floor and used his arms to slide out of the playing court similar to how he did when he suffered his achilles injury. But thankfully, Cousins got up, shaken up, slightly limping but all okay. He then proceeded to destroy the Pacers the rest of the way. Speaking of bad shooting nights, the Boston forwards had one of their own tonight. Gordon Hayward shot jut 1/6 for two points while Jayson Tatum scored six points on 3/9 shooting. Those two are relied on heavily to carry the scoring load. More so during a game like this where Kyrie Irving was sitting. Good thing for Bostons, their guard crew came up big. Marcus Smart filled up the stat sheet with 21 points, seven assists, five steals and two blocks. The most surprising stat of the night was Smart’s four three-pointers. He was a wrecking ball on both ends of the floor today. Jaylen Brown came off the bench to provide a scoring punch. He scored 21 points on three treys. Terry Rozier stepped into the starting role and finished with 14 points, seven rebounds and seven assists. The Celtics are still trying to figure everything out. There are games when their depth can be a problem. They have so many talented players and only a limited number of minutes to spread around. This can mean several players never getting their groove and as a result, the whole team ends up struggling. But during games like this when they’re wounded, the Celtics’ depth is life saver. They can lean on several players to produce and grind out a win. Even if they were missing Irving and the wings were having an off night, the guards came through to lead them to a bounce-back win. It’s been nearly three years since the Atlanta Hawks beat the Clippers. Today, that streak ended. Trae Young set the tone early and came up big in the clutch to lead the Hawks to a win over the Clippers in LA. He finished with 26 points and eight assists. Young dished a pass to Dewayne Dedmon for a dunk to increase a six-point lead to eight in the final two minutes. He then hit a dagger three-pointer to seal the win.